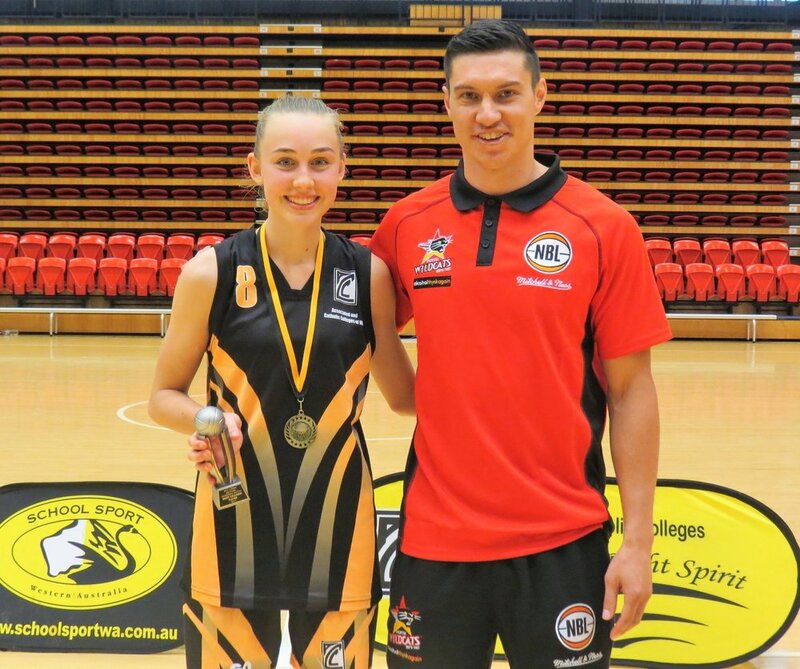 Corpus Christi College Year 11 student Carla Drennan has captained the Associated & Catholic Colleges All Stars girls team for the second year running, winning Most Valuable Player in the annual game versus the public schools’ School Sport WA team. Held on Sunday 15 October at Bendat Basketball Centre, Floreat, the All Stars match is an opportunity for the best players in different secondary school systems to meet each other and compete at the highest level in a friendly environment. After a closely fought first half, the ACC girls team pulled away to take their first victory over SSWA since the competition’s inception four years ago, winning 70-45 at the final buzzer. Carla top scored with 18 points, earning praise from competitors, teammates and sport coordinators alike. Perth Wildcats point guard Jarrod Kenny was on hand to present Carla with her MVP award and winners medal after the game. Corpus Christi College Sports Coordinator James Howard, who has been involved in ACC sports for over a decade, comments that “Carla has grown into a fine leader. She is already a highly successful athlete but it is her combination of integrity and talent that will see her continue to rise and thrive at the elite level.” With state-of-the-art sporting facilities, including new basketball courts opened for use in 2016, the College is committed to supporting its sporting talent and looks forward to upcoming interschool competitions.